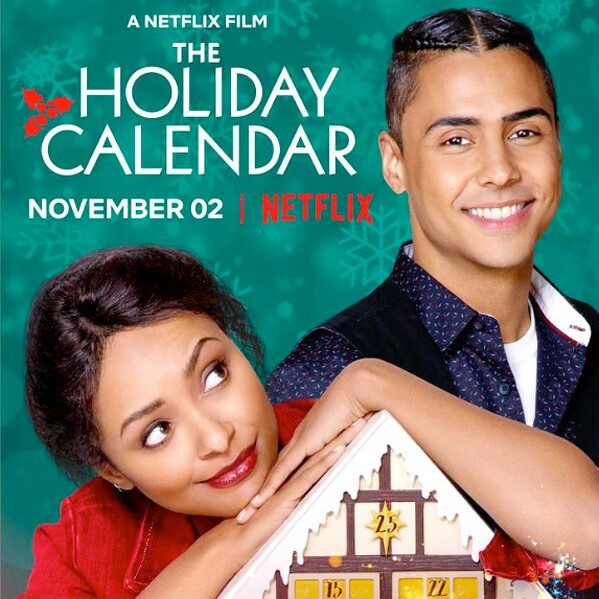 The new Netflix original film, The Holiday Calendar, is adorable. Clean, wholesome, engaging, and funny! In a time where we hear phrases like “4,012 original Christmas movies this season!” it can be tough weeding out the good from the not-so-good. To help you out, I’m sharing ten things I loved most about this movie and the one, itty bitty thing I didn’t love. For the sake of a happy ending, let’s start with the negative. The non-licensed Christmas music. You know what I’m talking about. Those songs when the couple is ice skating, opening presents, or building a snowman. The songs that sound kind of like a familiar Christmas song, but…isn’t. It may have the bells–jingle bells, handbells, church bells, etc. Or it may have the gospel choir singing in the background to the Mariah Carey impersonator. The lyrics of the first verse include words like snow, cookies, love, tree, lights, BELLS! But, like when your aunt tries to make your mom’s stuffing, something is…off. This movie had a record number of these songs. It was laughable. Fortunately, like most “We didn’t want to pay for popular songs, so we locked the Dancing with the Stars band in a room until they gave us ten songs to use in this movie,” you only need suffer through the first verse before the characters’ much better dialogue takes over. Real characters- They’re real! They make silly faces! They crack jokes—and not lame Christmas movies jokes either! The heroine is played by Kat Graham. I don’t know this actress but I love her. I hope she’ll be in more films in the future! Diversity– A Latina mayor, a heroine with a white mom and black dad, an Indian boss. This movie’s casting team clearly put thoughtful consideration into this and it works. Plus, each actor is perfect, making the role their own. Ron Cephas Jones! You know? Randall’s birth father William in This is Us? He’s great in this one! Abby’s studio apartment—Finally, the girl gets the awesome, trendy apartment with exposed brick walls. I’m making construction plans. The Fall-Asleep-Together-on-the-Couch Scene—I don’t know why I love this. But whether it’s a book or movie, if two people can enjoy a night sleep cuddling on a couch, it will surely add one star to my rating. Maybe it’s jealousy. The only thing I’ve fallen asleep cuddling on a couch is a box of chocolate covered cherries. Advent Calendars—I’ve begun hoarding advent calendars. I’m in desperate want of this one. It doesn’t even have to be magic. But I’m guessing if the trinkets inside mine predicted the future they would include a Mister Clean eraser and the song Christmas Shoes—you know it’s coming. Fernando—I need Fernando in my life. He puts all other holiday movie side characters to shame. Cosplay Christmas Story! Is this a thing? If so, I’m there! And I’m dressing as the kid with his tongue stuck to the pole. Bonus that the heroine’s other favorite Christmas movie is Silent Night, Deadly Night—lol. In conclusion, I highly recommend The Holiday Calendar! It’s cute and endearing. Perfect for a snow day or hot chocolatey night in! Join me on my journey and get exclusive content! Thank you for signing up to receive my newsletter! No spam, just announcements and prizes! Your support means very much to me! Feel free to message me anytime at Janine@janinerosche.com. I love connecting with people!